Security experts say that hackers/hijackers get active on such date. So you need to be more alert on these days. What!!! more that 60000 new malwares? Isn't it huge? How to Protect Your Computers From 10.10.10 Attack? If you haven't updated your antivirus for a long, this is right time to update. Make sure firewall is up and running properly. If you haven't set any rules for softwares to access the network to make inbound and outbound connections, data transfer, intrusion and ip scanning. Configure the firewall properly. Can you live a day without Internet? I know it's difficult. 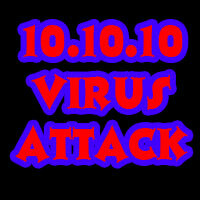 But if you can, it's better to remain offline on 10.10.10 to avoid any possible attack. Webmasters & Network Administrators need to keep an eye on the server activity logs, to prevent any inconvenience. This post is not to terrify you, neither is to spread any rumor like on Facebook, this is just an alert to the suspicious virus attack scheduled tomorrow. Above are the prevention measures to be taken to be safe. I hope everything goes well tomorrow! Praying it to be a rumor and if so, consider it as a mock drill :D What do you think? Well, you never know. So, it's best to not worry and just like the article say's make sure you have everything updated. Thanks for sharing.But it is difficult to live a day without internet.BWN I have updated everything.